Mountain View Motel is located in a quiet location yet only a 5-minute walk to the lake and a 10-minute walk to the many cafés, bars and restaurants – not to mention the retail therapy! Lake Taupo arrives in view like a gift. For miles, sweeping away toward distant mountains, the surface shines pearly and benign. Remarkably, the lake is the crater of a massive volcano, but it holds a power that demands respect even without the threat of eruption. It is so big, it has tides. And at one end of it, the lake empties into the Waikato River with terrifying urgency. 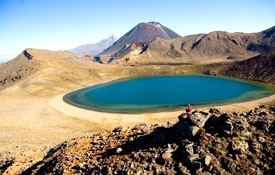 Across the other side of the lake, Tongariro National Park, with its skiing and its hiking and its incredible landscape, waits. Adventurers make a beeline for its off-road cycle trails, trekking paths, peaks and challenges. Nature cruises depart from Turangi showcasing the scenery and birdlife of southern Lake Taupo. Fishers stick to the edges of the lake and the heads of rivers around it – the Tongariro and the Tauranga-Taupo. After a day's activity they can join others to relax at the hot pools in Tokaanu. 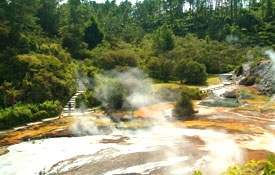 To the north of Taupo lies Orakei Korako, a geothermal site with gushing geysers, boiling mud pools and some of the largest silica terraces in the world; a must-see. 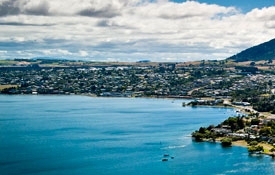 The town of Taupo, bustling and bristling with energy and entrepreneurs, hosts events year round – a lot of them sporting – and accommodates travellers on their way through the middle of the North Island. Take time out from your travels to get some exercise on Taupo's Two Mile Bay to Four Mile Bay Walkway with idyllic picnic and swimming spots. The walkway continues along a terrace above the lake to Five Mile Bay.